Following its landmark debut in baseball, 1991 Stadium Club Football kept up the momentum with a high-end set that showcased stellar photography. While the plentiful supply has kept prices soft, it's still one of the top sets from an era of overproduction. 1991 Stadium Club Football is a straightforward 500-card set. There are no inserts, no short prints and no gimmicks. Cards feature a full-bleed design that emphasizes great photography. Topps worked with Kodak to produce the set. The colors are bright and the images are vivid with lots of detail. Cards are printed on a glossy card stock. Other than the photo, card fronts have a small banner toward the bottom of the card. It has both the player's name and the Stadium Club logo. The banner features gold foil highlights. Card backs have a colorful field backdrop. Vital info is at the top of the card. The writeup features analysis fromThe Sporting News. Like 1991 Stadium Club Baseball, card backs also picture the players' rookie card (as defined by Topps at the time). Much of the value of the 1991 Stadium Club set comes from a single card -- the Brett Favre rookie. It is highlighted by an embarrassing error. 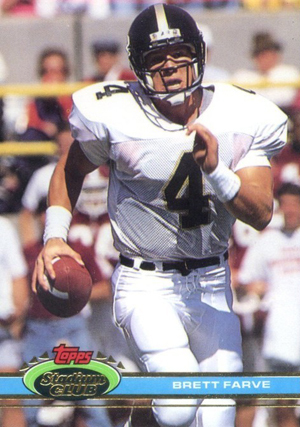 Favre's name is spelled "Farve" on both the front and back. Oops. It was never corrected. Among the other rookies in the set are Ricky Watters, Tony Siragusa and Russell Maryland. Although not an insert, 300 cards were reprinted for special packs handed out at Super Bowl XXVI in Minnesota. The cards are nearly identical to the regular issue except for an embossed Super Bowl XXVI logo that appears at the top of the card. 1991 Stadium Club Football boxes have 36 packs of 12 cards. 300 cards. Given out in conjunction with Super Bowl XXVI. Cards have an embossed logo at the top of the card but are otherwise identical to the regular issue. My first NFL game ever seen was in 2009 Vikings vs Packers. Vikings won! The player I’ve followed and admired was none other than Brett Favre. Interested in collecting his cards, I utilized “Cardboard Connection” top 5 Brett Favre cards. I went after the 1991 Topps Stadium Club Set. eBay had a complete 500 card set for $35.00 including shipping & handling. I am excited about this purchase, but more importantly, I am amazed by the design and style this set represents. I now realized why the two biggest card manufacturers Topps and Panini continues to utilize throw back inserts. Design, style, quality action shots, and color are amazing! I still enjoy the modern cards, I pulled a Andrew Luck Panini Black gold auto, 3 color patch card a few weeks ago. I will still look for great deals on eBay. Especially the vintage complete sets, and continue to collect modern cards! I’m looking forward to purchasing the Panini Totally Certified soon. I do have a question in regards to collecting complete sets in which Brett Favre cards are represented. Ryan, do you have any recommendations on sets that really standout in this regard? If not, a set that you would collect?Also, I am considering sending the Brett Favre rookie card to be graded at Beckett. Is this a wise choice? In summation, vintage or modern, the world of sports card collectibles are endless! Thank you in advance! Toshi � There are so many sets to choose from the Favre is in. My personal preference is often sets with great photography. I don’t have a ton of personal experience with grading myself. However, if you go to the How to section of the site (in the menu bar), there are some articles that should give you the info you’re looking for. I’ve been to so many other sites for football card information, in my humble opion your site is still the industry standard! I come to you today with a myriad of questions, I hope you can help me. I purchased a complete 1992 Stadium Club Set High Series. 1) What makes this set so difficult to find? 2) Why such a high price point? 3) Is this set a 100 card set? I noticed Series 1&2 are several hundred cards. If not, more! 4) Can you provide for me a “Checklist”? If not, where or who has one? 5) What are the KEY cards in this set? I assume Brett Favre is one of them. 6) To call this set truly complete, do I need to obtain Series 1&2 to call my collection a complete set? 7) And finally a comment; “Thank you so much for allowing me the opportunity to consult with you. A quick note! I just purchased a T-206 Honus Wagner #11 Maroney card for $17.25. I can’t wait for it to arrive! I tried to look into acquiring a 1894 Mayo, but they seem to start at $225.00 and of course as high as 1.2 million! Maybe for Christmas! Toshi � Thanks for the kind words. We have an excellent team that works very hard. The High Series is valuable because of its rarity. Besides the Favre, the key cards are of Hall of Famers like Montana, Rice and Marino. The only checklist I have right now is in print unfortunately. Toshi � It’s in a book, which would be difficult unfortunately. After searching high and low, I have finally created a compilation check list of the Complete 1992 Topps Stadium Club Series 1, Series 2, and the High Series (Series 3). If I may share this list with you and the many devoted readers of “Cardboard Connection”, I would be honored if you could add this list to a new write up/review of the Complete 1992 Topps Stadium Club Check list. Please forward me a email so that I may send this list to you. It is a list representing 700 NFL players. Please note, I was inspired through “Cardboard Connection” in completing this daunting task. This is a sweet set of cards that really took football cards to a new level. I also was able to put the SB embossed set of 300 together and I believe that there are probably less than 10 complete sets in existence. first off the 1991 stadium club football set was 600 cards not 500 the 1992 set was 50 and the 1993 was 750. A good set containing the Brett Favre RC. photos but this set gets away with it.